smArtAction: A estudiar y a luchar! On November 6th, Stephen Duncombe will present a special program as part of smArtAction, a student-led art exhibition presented at El Puente and Hostos Community College featuring various art forms and creative interpretations relating to the University of Puerto Rico student movement of 2010 and 2011. Details included below. 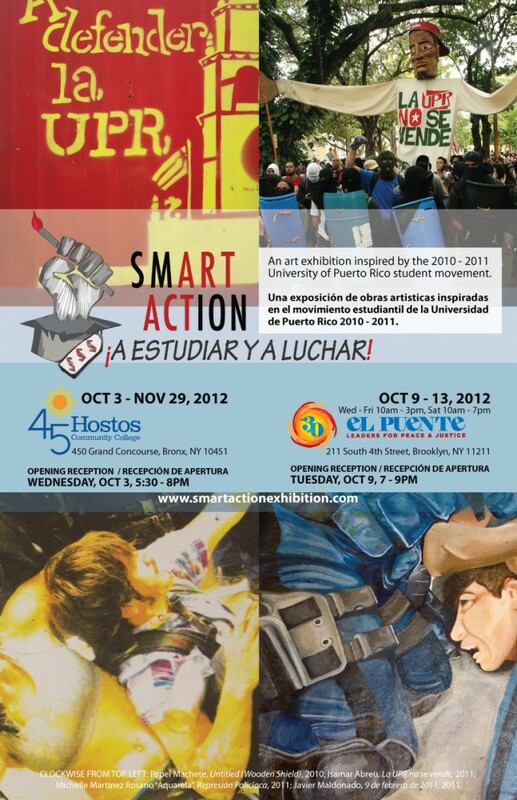 The smArtAction exhibition will be hosted by El Puente in Brooklyn and Hostos Community College in the Bronx. During this time, we will have a number of different workshops, performances, and presentations that will contextualize the University of Puerto Rico Student Movement. and the smArtAction exhibition. Come learn more about smArtAction: ¡A estudiar y a luchar!, engage with El Puente CADRE (Community Artists’ Development and Resource Exchange) and discover how members of Los Sures can partake in this exciting and important project! 5-7PM at 91 South 4th Street in Williamsburg, BK. More info HERE. 5:30 – 8PM at Hostos, 450 Grand Concourse in the South Bronx. 7 – 9PM at El Puente, 211 South 4th Street, in Williamsburg, BK. WEPA! Fest and smArtAction Performance Night! The smArtAction team is collaborating with the El Puente Green Light District to present a special night of performance, featuring smArtAction contributing artists from Puerto Rico and New York, and performance acts by members of the Southside of Williamsburg, Brooklyn community. The event will also showcase resent results from the El Puente Green Light District WEPA! Project, a cultural assets mapping project designed to document and share the creative activity in the Southside of Williamsburg, Brooklyn. 4-7PM at El Puente, 211 South 4th Street, Williamsburg, BK. Throughout history, the most effective political actors have married the arts with campaigns for social change. While Martin Luther King Jr is now largely remembered for his example of moral courage, social movement historian Doug McAdam’s estimation of King’s “genius for strategic dramaturgy,” likely better explains the success of his campaigns. The practice of artistic activism has only accelerated in recent times, as savvy organizers learn to use the increasingly mediated political terrain of signs and symbols, stories and spectacles to their advantage. Join activist and author Stephen Duncombe, co-founder and director of the Center for Artistic Activism and the School for Creative Activism, for a workshop on approaching tactics, strategy, and goal setting from an artistic and aesthetic perspective. 3 – 5PM at Hostos Community College in the South Bronx (exact location TBD).